Bill, our BLG reader this week, brought in a very amusing book – Those Darn Squirrels and the Cat Next Door. 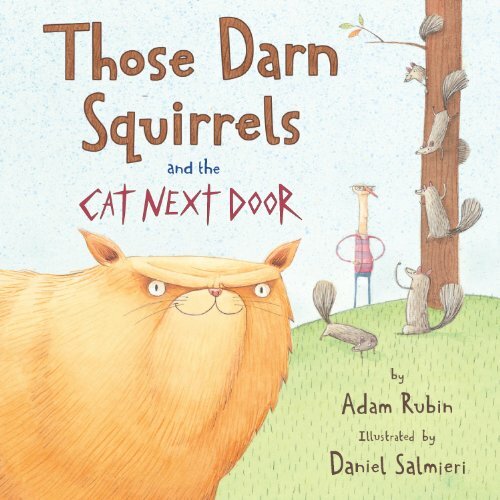 This book is written by Adam Rubin and illustrated by Daniel Salmieri who collaborated on an earlier title Those Darn Squirrels. This book starts out with Old Man Fookwire, a grumpy bird enthusiast who is sitting in his living room waiting for winter to pass so he can get out into his garden and paint the beautiful birds that visit his yard. He is harassed by a group of pesky, but extremely clever squirrels who sneak into his house, eat his food and generally annoy him. When a new neighbour moves in next door (Little Old Lady Hu) with her cat Muffins, it seems that things may change in the neighbourhood. Squirrels may be champions of the forest but perhaps in Muffins, they have met their match. My confession? I’m rooting for the cat! Is that terrible? I was silently cheering when the squirrels got ambushed. I was more than amused when Muffins gave them wedgies (you need the illustration to understand the wrapped around and twisted tails) But, I have good reason. My backyard is inhabitated by a bunch of squirrels – they chase away birds, fight in my flowers and try heroic gymnastics to leap onto the bird-feeders and eat my expensive seed. I don’t like these squirrels. At all. So basically I don’t like squirrels in general. In this book, I was really hoping that Muffins would show them who was boss. But let’s just say that the squirrel brain power was more of a factor in this story than I had hoped it to be . . .
Adam Rubin tells a very funny tale (check out his interesting blog Tickling the Brain) and the illustrations by Salmieri are hilarious. Old Man Fookwire’s nose, a soggy Muffins the cat, squirrels with wedgies . . . Daniel Salmieri engages his viewers with clever details. The perfect book to read when you need to laugh a few times over. Hajhare: I liked this book because it reminds me of Chester the Cat. This cat in this book is really funny! **Hajhare is referring to Melanie Watt’s fictitious feline. Alyson: I like the part when the cat got karma and H2O spilled on him. Ricky: This was a very funny book. It made me laugh out loud in myself. Bill what made you read this book? I really liked it. Kevin: There was karma in that book that Bill read because the cat always scared the squirrels away. One day they decided to make a plan to get rid of the cat. They used yarn and tied it on to the birds. They used really cold water and put it in a bucket and put it on three branches and tied it onto the bucket. The next day the cat came to the birds and scared them. The cold water spilled on the cat and the cat turned wet, soggy, skinny, scared and mad. The cat went home and never came back. I liked that book! This entry was posted in BLG Reads this week and tagged Adam Rubin, BLG Reads, Daniel Salmieri, favourite illustrators, fiction, great read alouds, picture books by carriegelson. Bookmark the permalink.